A large blank canvas in downtown Carrboro is about to get a makeover, again. Local artist Emily Weinstein said the outside wall of Jade Palace Chinese & Seafood Restaurant, located at 103 E. Main St., will soon feature a new mural. Local artist Emily Weinstein is designing and coordinating the painting of a new mural on the outdoor wall of Jade Palace at 103 E. Main St. in downtown Carrboro. She will enlist the help of local children to paint the Jade Palace mural. 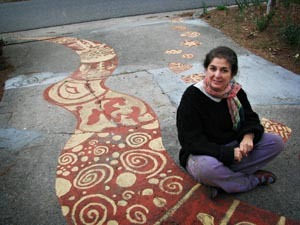 This mural in her driveway was painted by kids in her neighborhood, located off Ephesus Church Road in Chapel Hill. The original community mural on the outside wall of Jade Palace was painted in 2001, but it was mysteriously painted over in 2007. The new mural will feature elements of the Chinese zodiac. “We are going to get started as soon as the paint comes in and everything gets organized,” Weinstein said. She is in the last stages of designing the mural, which will feature elements of the Chinese zodiac. She has ordered special paint that resists the wear and tear that sometimes plagues outdoor murals. The actual painting process will be coordinated by Weinstein. She plans to enlist the help of local children through Volunteers for Youth, an organization that finds volunteers and mentors for children in Orange County. “We’re going to set up a spring or summer program with the kids,” Weinstein said. The wall used to be home to another mural that was painted in late 2002. It was the brainchild of Kimberli Matin, who owned the Zodi Gallery that was located next to Jade Palace. Local businesses and residents were able to purchase squares of the quilt-like design and participate in the painting process, said Jackie Helvey, owner of UniqueOrn Enterprises. Weinstein oversaw the project, which featured the theme, “What does community mean to me?” The money earned from the project was donated to Club Nova, a non-profit organization in Carrboro that helps adults with mental illnesses, Helvey said. However, Helvey said the painters of the mural faced problems from the beginning. The mural was in violation of a town ordinance that prohibits putting business names on the side of a building if the businesses aren’t actually housed inside the building. “We were breaking the law, and we didn’t know it,” Helvey said. She said a solution was reached when the Carrboro Arts Committee, the Town of Carrboro’s arts advisory board, contacted Patrick Herron, Carrboro’s poet laureate at the time. The committee commissioned Herron to write a 32-word poem that would be painted over the 32 logos on the mural that were in violation of the town ordinance. Each offending logo was covered, and one word from the poem and a number were painted in each square. The numbers corresponded to the sequence of the 32 words that when put in order, revealed the poem. Helvey said it was nearly impossible to read the poem, but she thought the puzzle format was a creative way to avoid having to completely cover up the mural. After it was altered in late 2003, the Jade Palace mural remained a downtown Carrboro staple until May 2007, when it was mysteriously painted over. Helvey said what happened remains uncertain, but within about an hour, the entire mural was covered with a coat of light mint-green paint. A former Carrboro resident apparently hired men from the homeless shelter to paint the wall. Helvey said the man previously had his own mural issues in downtown Carrboro, when a mural on a building he owned was in violation of the same ordinance as the original Jade Palace mural. The man did not immediately revise the painting on his building, and it got to the point where the town was prepared to take legal action, Helvey said. He eventually covered it up, and sometime thereafter, he moved to California. “He must have been out there in California stewing,” said Helvey. Helvey thinks the man flew back to Carrboro in May of 2007, hired the men, and then left while they were in the middle of painting the Jade Palace wall without paying them. “Literally hours and weeks of work in that one hour was completely obliterated,” Helvey said. Although Helvey and Weinstein say they are enthusiastic about the new mural, not everyone who participated in the creation of the original artwork shares their sentiments. Herron wrote the poem “I Am Not A Wall” that was used to alter the mural so that it would comply with town rules. Herron said the puzzle format was not his idea and that he did not know his work would be used in that form until he actually saw it on the mural. He said the piece was “impossible to read,” but he did not complain. However, Herron’s primary concern now is about the repainting of the mural. He feels that the poem, which was site-specific and dedicated to former Carrboro Mayor Mike Nelson, is being treated as “disposable” by not being included in the new design. Despite the mural’s history of controversy and mystery, its story will continue during the spring with Weinstein leading the effort once again. Click here to see a photo of the original Jade Palace mural.